As I sit down to write this post, it’s hard to believe that I am entering the final year of my twenties. At the same time I find it difficult to comprehend that I’m only 29. So many things have happened in this decade — some unexpected and others wonderful. All of them have tested me as a person, and have made me a better human being. I’ve joked amongst friends that I feel as though I’m turning 129 (don’t I look good for my age?). This may sound strange, but my life has taken so many twists and turns that I can’t believe I’ve managed to cram it all into 29 short years. Yet I am most grateful for everything that has made up this decade for me. Of course, there have been hard lessons to learn as I’ve transitioned from college student to working professional, and went from having a 9-to-5 to following my passion for writing and blogging. Below I’ve rounded up nine things I learned in the past nine years of my twenties. Age 20. It’s okay not to have all the answers. What fun would life be if you knew it all in your twenties? I’ve said before on the blog that I was always someone who liked to have a plan…and usually a couple of them. As I’ve gotten older and changed jobs more than a few times, I’ve learned that it’s okay not to know which road you want to go down, admitting you made a mistake, or wanting to change course midstream. Some of these things you can only learn by doing. Age 21. Make and maintain relationships with mentors. Just because you are no longer a student it doesn’t mean that you can’t keep in touch with professors who have mentored you during your four-years. If you had no mentor in college, try to find one at your first job, or attend a networking event in your field. Having a mentor to guide you during the early stages of your career is an asset to be treasured. Once you find your mentor, make sure you take the time to nurture the relationship. Whether you communicate through emails, texts, or calls, make it a priority to check in with your mentor and update them on your career successes. Age 22. Your college major isn’t the key to your first position. When I graduated with a political science degree, I thought the natural path was a career in law or criminology. Every time I tried going outside those fields, I stopped myself because I thought “that’s not what I went to school for.” Your degree gives you the tools to succeed in many fields, and some may even be outside of what you studied. Age 23. Start educating yourself about money. Chances are terms like 401K, 403B, and IRA Roth are going to be new to you in your twenties. If they’re not, I applaud you for being a studious youngster. Saving money is an important part of being an adult, and the earlier you start saving, the more time your money has to grow. You can begin by reading up on financial literacy and perusing one of Suze Orman’s many books. I found her book, Women & Money helpful when I was starting out. Age 24. Spend less than you make. This may seem obvious, but too many people violate this principle. I’ve always abided by Suze Orman’s rules: buy needs, not wants and live below your means, but within your needs. If you do these two simple things you will start creating a solid financial future for yourself. Age 25. Know your worth. It may seem frightening or unprofessional to negotiate your salary when you are just starting out, but it’s important to know your worth. Sites like Career Contessa have great articles with step-by-step guides about how to negotiate your salary, and Glassdoor is another valuable resource to consult when you are in the early stages of the interview process. Age 26. Don’t undervalue your happiness. I know this is going to sound like a contradiction after my last two points about money, but you can’t put a price on your happiness…or worse, your health. I’ve had jobs where the thought of going in every morning gave me more anxiety than a long-distance flight (I hate flying, by the way). When you remain tethered to a job that makes you miserable it can affect you physically, emotionally, and mentally; your relationships suffer as well. We all need money to survive, so please don’t go quitting your gut-wrenching position without a plan in place. But suffering for a paycheck is never a good idea…and deleterious in the long-run. Age 27. Seek out your passion. Your twenties are the time to try new endeavors, so explore your interests. You may be surprised to find that you are creative (like I did when I started this blog), or that you are good with numbers (unlike me as evidenced through more math classes than I would like to recollect). Whatever you find yourself dabbling in, remember that it is time well spent. It could be a lucrative side-hustle or turn into your primary career. Age 28. The worst mistake you can ever make is failing to try. One of my favorite quotes is by Erin Hanson and reads “But what if I fail? Oh, but my darling, what if you fly?” We always think of failure, or rather about not failing in our ventures. But win, lose, or draw, failure teaches you just as much as success ever could. Don’t think of failure as the end-all-be-all. Instead, look at it as a real-life teacher that shows you just what you need to work on. 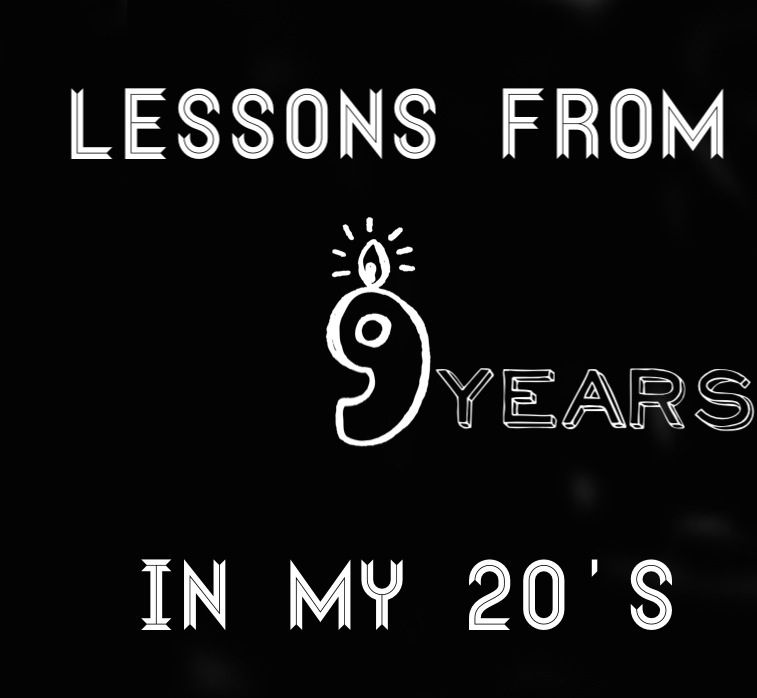 I could go on and on, but I thought I would be pushing my luck (and your attention span) listing 29 things I learned in 29 years. With each year that passes we tend to learn more about ourselves, our passions, and what we want to accomplish in the next year of our lives. I’ve said this before, but I am most grateful for this creative space, my lovely readers, and those I’ve connected with through the blogging world. Thank you for making this endeavor of mine such a rewarding experience. I look forward to seeing what the next (and final year) of my twenties brings. I love this! I’ll be turning 29 in February, and I recognize a lot of these similar thread through my years. I’m so glad you brought these together into one post! Thank you so much, Jessica! I’m glad this post resonated with you. Hope you have a great weekend! 29 is a great age. I loved my 20’s but you do grow up a lot by the end of the decade. Your growth sounds exactly like my own during that decade. Your 30’s will be even better. Have a great weekend! Thanks, Kathy! I’m strangely looking forward to my 30’s. But I’m going to take full advantage of my last year as a twenty-something. Hope you have a great weekend! Thank you! I’m glad you enjoyed it and I hope you have a great weekend. Was your birthday yesterday, Vanessa! I know November is “your month” but I don’t know the exact day. Happy Birthday!! I wish you all the best! That quote by Erin Hanson has become one of my favorites! Enjoy this new year and continue celebrating your special month! Thanks so much for the bday wishes, Danielle! My birthday is actually tomorrow. I’m glad you enjoyed the post and I hope you have a fabulous weekend. Great post! I agree 100% with each of these!! I hope you have an amazing day and start to your weekend, beautiful! Thanks, Jalisa! It’s true that you have so many experiences at different points in your twenties. It was interesting to sit down and think of everything that I’ve learned so far. I’m glad you enjoyed the post and I hope you have a wonderful weekend. Thanks, Kathrine! I’m excited about all the lessons I’ll learn in my 30’s. But I’m going to savor this final year as a twenty-something. Hope you have a great weekend! soo good! Please stop by my blog for my latest post! Thanks, Olia! I’m glad you enjoyed the post and thanks for visiting Living in Steil. This is such a great breakdown of life in our 20s! So much great advice here. Hope you have a great weekend! Thanks, Heidi! Hope you have a great weekend, too. Such incredible words of wisdom. It’s amazing how fast 20 flies by isn’t it? Thanks, Jill! Yes, time flies in you 20’s. Hope you have a great weekend! Thanks, Tanya! I’m so glad this post resonated with you. Hope you have a great weekend! I am inviting everyone who reads this to participate in my jexshop giveaway. Thanks, Alyssa! I’m glad you enjoyed the post. Have a great weekend! Vanessa — I simply LOVED this post. You’re incredibly wise and so many things you said here are spot on (down to the age) with my own journey through my 20’s. It’s so lovely to be able to read and relate to others like this. I hope 29 is an amazing year for you!! Thanks, Tristan! I love hearing that you were able to relate to this post. It’s amazing the lessons we learn on this journey, and I’m excited to see what 29 will teach me. This such a beautifully written post! I loved reading this…thanks for sharing! Thank you so much, Valerie! I’m glad you enjoyed this post. Agreed! I wish I had someone guide me through my 20s. Having a mentor in your 20’s is a wonderful thing. I’m glad you enjoyed the post! Hope you have an other amazing year ahead of you! Although I’m 16, I think this is great advice! That quote is also one of my favorites, it’s always good to try new things, maybe you’ll love it, maybe you won’t, but you’ll never know without trying! Have a great week! Thanks so much, Esther! I’m glad you liked the quote and enjoyed the post. It’s awesome to be alive and learn something new every year, isn’t it! Thanks for sharing your experience! Thanks, Prudence! I’ve enjoyed all of the lessons I’ve learned so far, and I can’t wait to see what this next year has in store for me. Thanks for sharing your wonderful experience, I loved reading this post! Thanks, Carine! I’m so glad you found the post insightful. Thanks! So glad you found the post insightful.